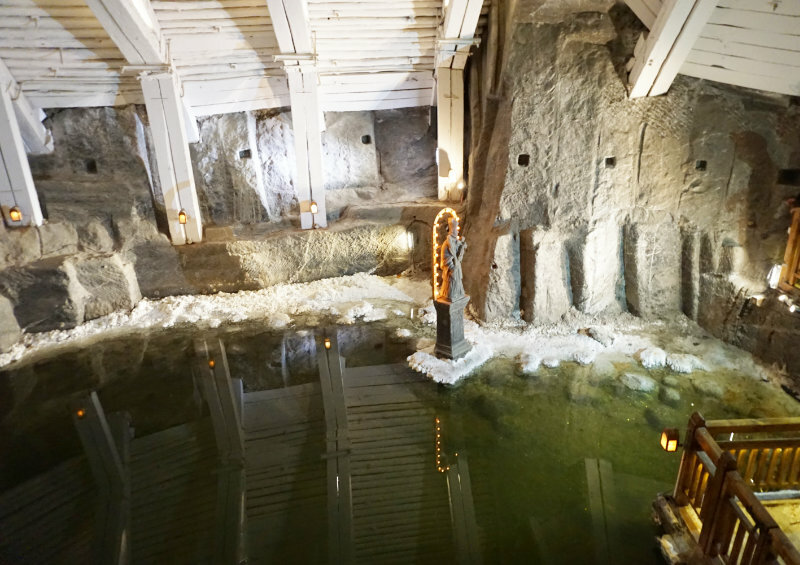 The trip to the salt mine Wieliczka was the most exciting, informative and fascinating excursion that we had the pleasure to experience during our time in Krakow. A personal favourite of mine and worthwhile for sure. The train from the Central Station takes a little over 20 minutes to Wieliczka Rynek Kopalnia (terminus). From there it is another 5 minutes on foot to the salt mine. It is very well signposted. 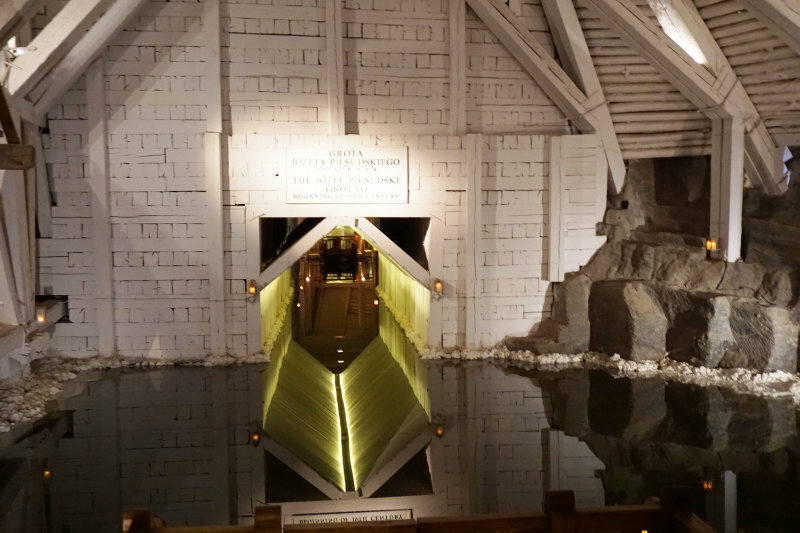 The salt mine was declared UNESCO World Cultural Heritage and World Natural Heritage in 1978 and can only be visited with a guide. Tours are offered in Polish and – at certain times during the day – also in English, German, Russian, French, Italian and Spanish. The number of spots in each group is limited. I purchased our tickets online in advance. That made sure that I was really going to be able to join one of the German groups. Other visitors were not as lucky as all of the three German tours were fully booked on that day. I am sure that interest is even bigger during main season. Another advantage of the online tickets are the queues. The online tickets are to be picked up at separate ticket counters. Photo permits can be purchased there, too. These counters were deserted whereas the normal counters had long queues to work through. A few minutes prior to our entry time, we joined the German group. Everyone was handed headphones and a receiver. The guide explained how to use them and which channel he’d be on during the tour. His German was very good and I heard him loud and clear. But it was obvious that he had been doing this job for quite some time. A fixed routine of jokes and rattled out explanations without much enthusiasm. However, he happily took questions from the group and offered more in-depth explanations whenever we requested them. 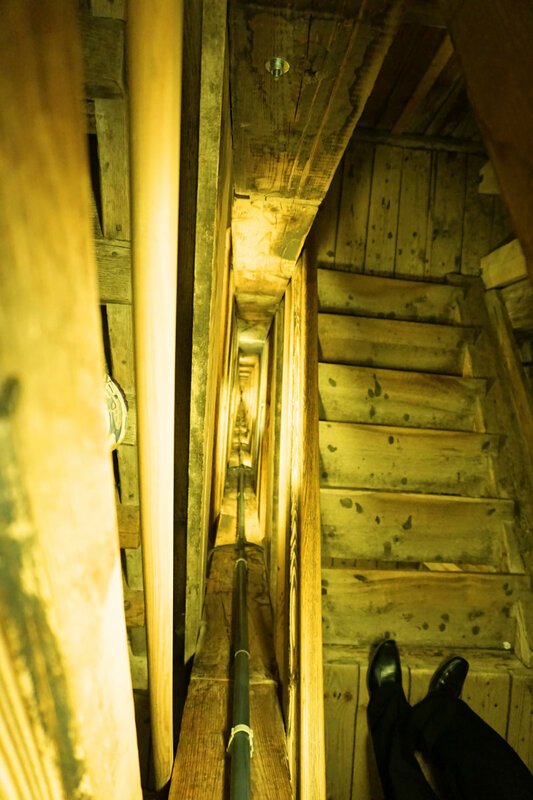 After all the 30 people in the group had familiarised themselves with the equipment, our guide led us to a wooden staircase. 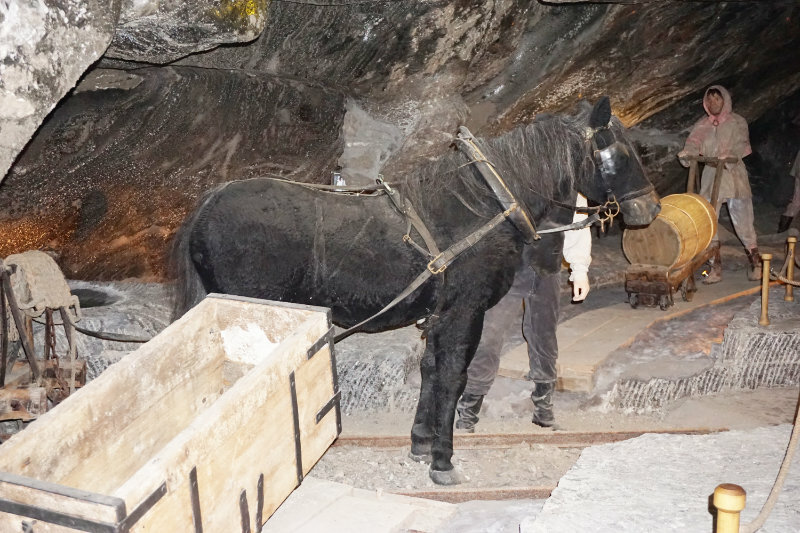 It took us 800 steps down into the mine. Little traffic jams on the staircase had us waiting several times. A bizarre feeling to descend deeper and deeper into the tunnel. Indeed not the environment for claustrophobic people. For me, personally, the thought of the thousands of tonnes of rocks over me made me shiver. I have the utmost respect for the people that laboriously had to dig through them. Many of these underground pathways lead through tunnels with a relatively easy access and with level floors. Wherever we walked, we walked on salt which had become smooth and shiny from all the feet polishing it day in and day out. By the way; I didn’t follow the guide’s suggestion to lick the floor. Not everything has to be a first-hand experience, I think. The path through the tunnel was well lit and led through different rooms where our group briefly stopped. Enough time for me to take some pictures and to listen to the explanations of the guide. In the rooms, the old tools of the workers were on display. 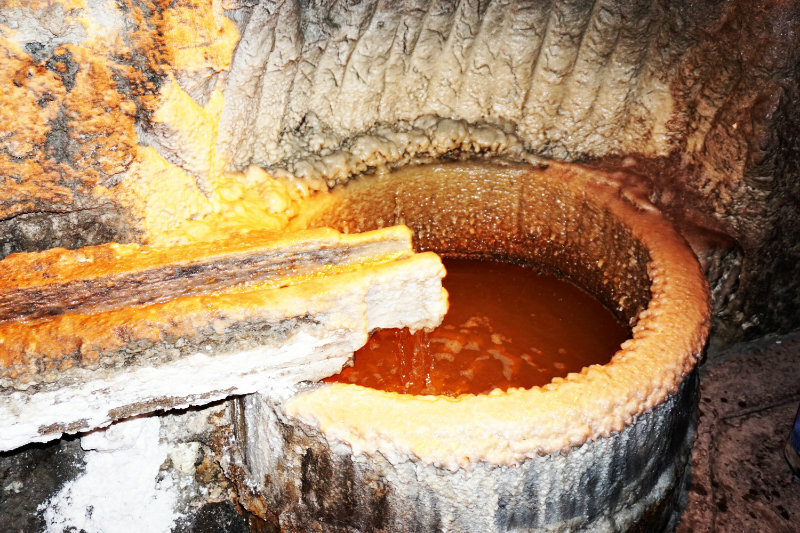 The guide explained or even demonstrated how they were used. Other rooms showed scenes from the life underground; complete with life-sized figures of the workers. What enthused me the most, however, were the rooms where artists and sculptors had created pieces of art. Wonderful sculptures carved into the salt and of course now each with a spotlight for better visibility gave the old mine a touch of an underground gallery. I would have loved to spend more time here than the tour allowed. But the next group was waiting behind us and we had to hurry along. One of the bigger rooms held an underground saline lake that caught the lights just right and created stunning reflexes and reflections. The highlight of the tour was the Great Hall and the Underground Chapel. We entered the Great Hall over some sort of Gallery that is roughly ten meters above the ground. The view from here down into the hall swept me off my feet. 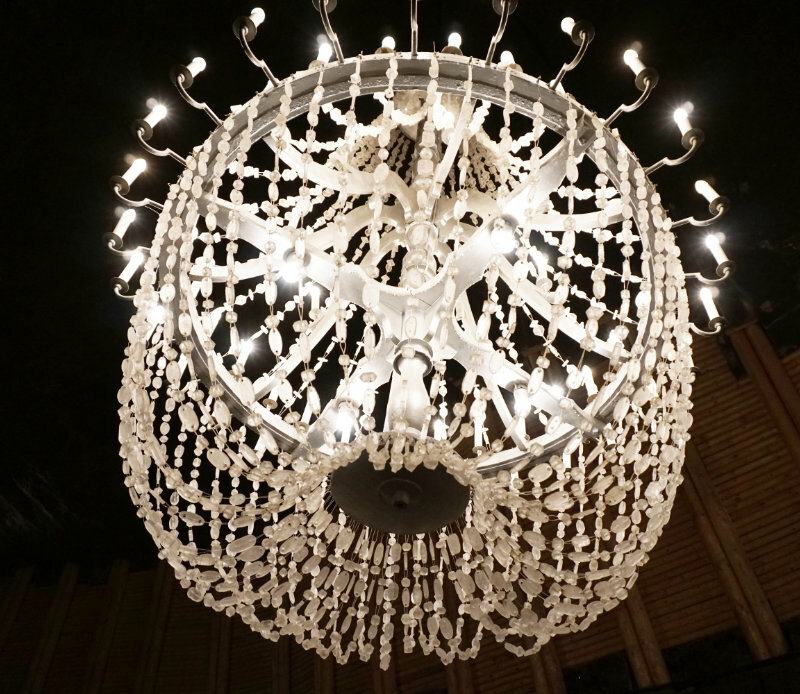 Big chandeliers, entirely made from salt, light up the room. 2 wide staircases lead down into the Great Hall which is about the same size as an indoor pitch. The photographs I took don’t do it justice. 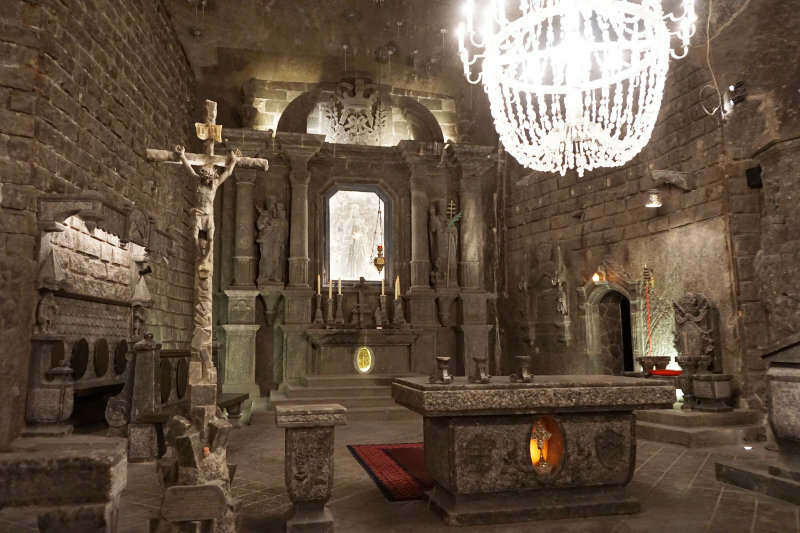 At the far end of the room is an altar, carved into the salt. 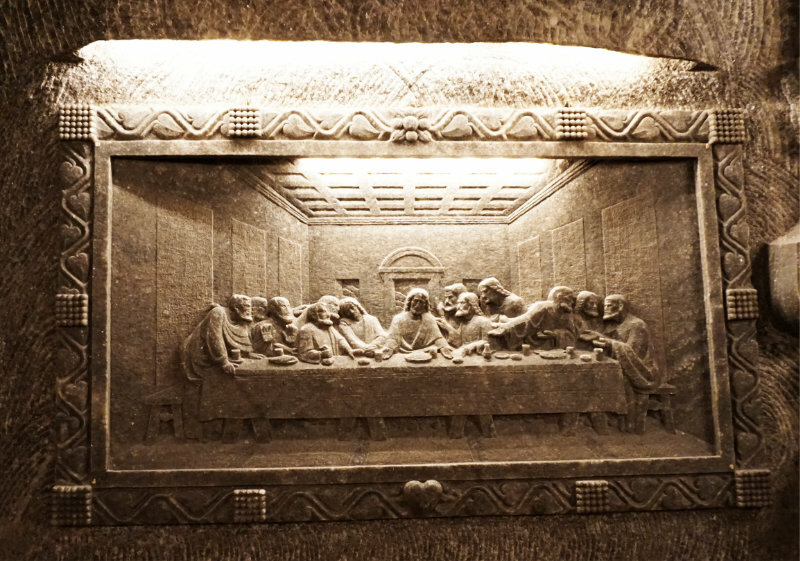 The walls of the room are decorated with reliefs that show different biblical scenes. I liked the depiction of the Last Supper the best. But the huge chandeliers were by far the most impressive. They are entirely made out of salt. The salt crystals dim the light and reflect it in all the colours of the rainbow. 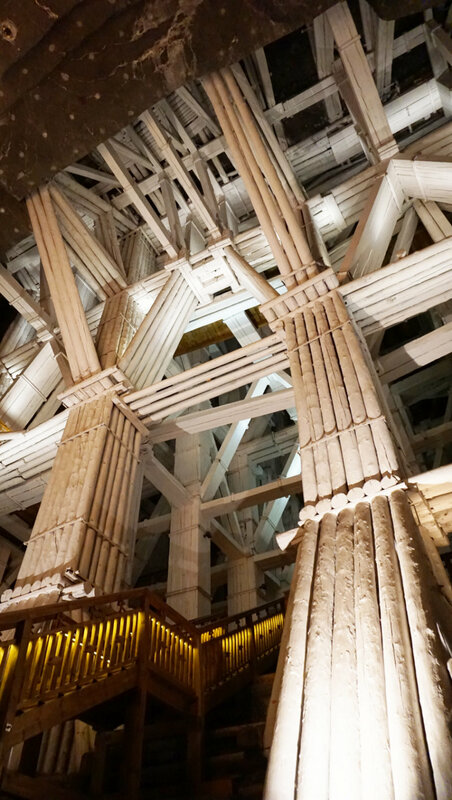 After almost three hours our guided tour through the salt mine Wieliczka came to an end. The guide showed us on a map how we can get back to the surface again. Obviously, this way would bring us through the gift shop and the restaurant. Our guide announced that he was not going to go up with us and a wave of nervousness rolled through the group. But there is no need to worry. Signs mark the way to the exit and no one needs to get lost on the way out. We never really thought about the way out and I was starting to wonder if I had to climb all the stairs again that we came down earlier. We followed the signs for the exit to a meeting point. Frome there, groups of people were guided into an elevator. That answered my question about climbing the stairs. That elevator was another highlight of the visit. It consists of thee compartments, stacked on top of each other, which the guides crammed with ten people each. It was like riding the metro during rush hour; we were packed so tightly that moving or turning was impossible and the doors of the elevator almost didn’t close. The elevator zooms to the surface in a few seconds. Almost like a rollercoaster. Some of the people in the elevator were a little intimidated by the situation but I enjoyed the ride. I would have loved to go for another one! 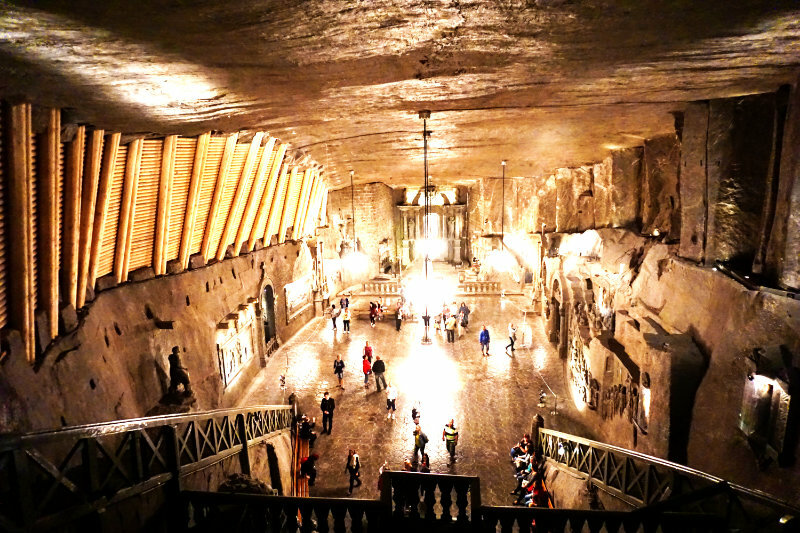 The trip to the salt mine Wieliczka was a huge success for me. The visit was, despite the tourists that are driven through the tunnels in insane numbers, absolutely worthwhile. I learned plenty of new things and gathered new experiences underground. What a great day! Please visit the website of the provider for ticket prices.